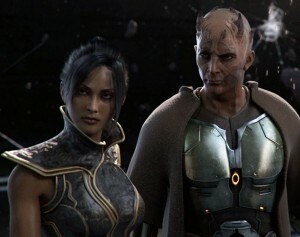 First off, I want to clear something up: I stated last week that I wanted to see how Satele and Revan would do on a team-up. Do I believe that Revan is still out there? Yes. Do I believe that he’ll make a return? Yes. I’m not going to divulge any secrets and I’m not going to go into any details. BioWare, Drew Karpyshyn, and Lucas Co. have left this wide open for his return. Will it be the perfect expansion? Maybe… Do keep this in mind: The Revanchrist did not die. He blinked out of the last spot of trouble he was in and hasn’t been heard from since. The big star of KoToR is surely going to show up at some point. While there’s a lot of chatter about Revan being a “used” character and should be considered “done” in TOR, there are others who feel differently. If BioWare were to follow the model set out by another MMO with expansions, which is a high probability, Revan would be the perfect lead character for the Republic side of the expansion. This is much the same as Tirion Fordring was portrayed in the Wrath of the Lich King expansion for Blizzard. Revan could be the mentor for the character(s) when they face the great evil that returns to the galaxy, then standing shoulder-to-shoulder with the heroes to face down the great evil at the end of the expansion. At that time, he could go bye-bye. Now, getting on to his descendent, Satele, the hottie with the double-bladed lightsaber. Where did she start at? Satele was born in the years leading up to the Great Galactic War, in a time when the Republic was ignorant to the fact that the Sith were out amongst the stars, waiting to strike. Born on the world of Brentaal IV, Satele was found to be a good choice to begin Jedi training at an early age. I’m sure there were a few masters among the Jedi that had their reservations about Satele becoming a Jedi. 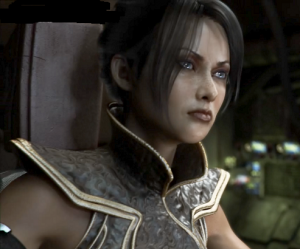 The name Shan would be an easy clue to know that she was related to Bastila Shan, which in turn would make her a descendent of Revan. The Council had to know how those two individuals when against Jedi rules and traditions, plus that Revan was responsible for a full-fledged attack upon the Republic. To reintroduce that gene pool back into the Order had to have some a little apprehensive. Eventually, Satele was apprenticed to Ngani Zho, as his padawan. Satele would serve as his padawan for some time before she would become the padawan of the Zabrak Jedi Master, Kao Cen Darach. Under Master Darach, Satele would be present when the outbreak of war began. As depicted in the trailer, Return, Satele and Master Darach were on the space station above Korriban when the Sith made their vicious return, attacking Republic Forces to retake their former homeworld. 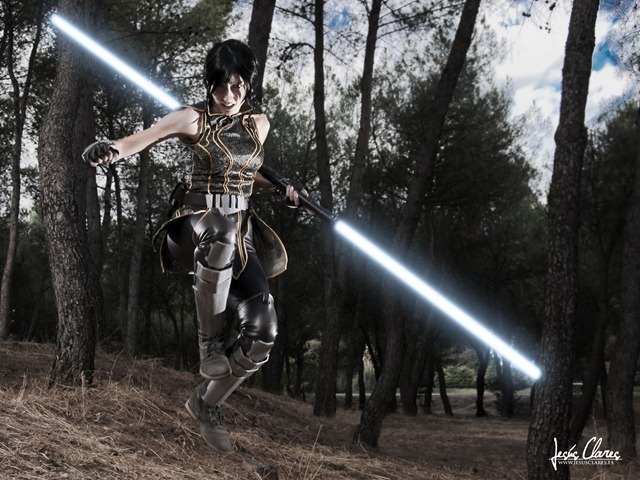 During the attack, Satele and her master faced two Sith lords in lightsaber combat, Vindican and Malgus. I’m not going to say that the two Jedi could have taken the two Sith, but it would have been one helluva fight. But, in the spirit of storytelling, Darach urged Satele to board the ship of the smuggler Nico Okarr and warn the Republic of the Sith’s return. Satele gave her saber staff to her master and ran to jump up to the ramp of the departing ship. Satele sensed the death of her master as the trio of surviving characters made their escape from the Sith. In the Return trailer, not only are we introduced to the Jedi archtypes, but we also are introduced to the Smuggler and Trooper archtypes. The Trooper was none other than Corporal Jace Malcom. After her escape, Satele was able to complete her apprenticeship under a new master, Dar’Nala. Being granted knighthood, Satele would go on to be another combatant in the war against the Sith. It was also during this time that Satele would rediscover the lost Jedi world of Tython. Once again, Satele would cross paths with Malgus, this time during the surprise attack on the core world of Alderaan. The Sith attacked the planet in stunning effectiveness, leaving destruction in their wake. This was just one more attack that the Sith undertook that was turning into an almost route of the Republic. It was at this point that the war would begin to take a turn in favor of the Republic. Satele, along with Havoc Squad and other Republic forces spearheaded a counter-attack against the Sith, which would leave Darth Malgus injured and the Republic finally victorious. In the action-packed trailer, Hope, we see just how hard Satele and her comrades were willing to fight to repel the Sith. Next week, we’ll finish out what I hoped would be a two-parter, but it’s going to have to be three parters. Hopefully, Satele can show up on time.